Many people think that accidental drowning in a bathtub is a risk faced by babies and young children, not by adults. However, statistics indicate that people of all ages can be killed or seriously injured by a drowning or near-drowning event in a bathtub. The topic made headlines recently with the death of Bollywood actress Sridevi Kapoor, who passed away due to “accidental drowning” in a bathtub, according to a Dubai police report. Kapoor was 54 and otherwise healthy at the time. According to police reports, Kapoor had entered the bathroom after having dinner with her husband. When she hadn’t returned after about 15 minutes, her husband knocked on the door to check on her. Hearing nothing, he entered to find Kapoor lying in the bathtub. Police believe that Kapoor lost her balance, fell into the tub, and drowned. Bath-related accidents and deaths don’t just happen in Dubai, either. 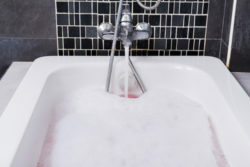 About 110,000 people are injured in bathtub and shower accidents in the U.S. each year, according to the Consumer Product Safety Commission (CPSC). About 10 people die each day from unintentional drowning in swimming pools and bathtubs, according to the Centers for Disease Control and Prevention (CDC). While about 75 percent of those who drown in bathtubs or pools are under the age of 5, CDC statistics show that no age group is immune to drowning accidents. Even if the accident doesn’t prove fatal, it can cause severe brain damage with lifelong consequences. If you or someone you love has been injured in a drowning or near-drowning in a bathtub, shower, or swimming pool, an experienced attorney can help you understand your legal options and pursue the best course of action for you. The attorneys at the Law Offices of Richard A. Stoloff focus on defending your legal rights and maximizing your compensation. If you need help after an injury, contact us today by calling our Philadelphia office at 215-988-9800 or our Linwood, NJ office at 609-601-2233. Your initial consultation is free and confidential.